I began shopping for my 1st bike in October 2009. 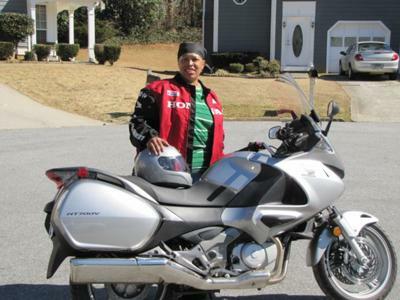 My late husband owned a Honda CBR1000 and was going to buy me one. I was a little afraid of the CBR, but Honda was where I started. The NT700v was due out in November but I fell in love with it without ever having seen it. When it finally hit the showroom, I checked it out and knew it was what I wanted. When I sat on it, it just "felt" right. I bought it January 24, 2010. Honda classifies it as a sport-touring bike. It looks sporty, but is as comfortable as a touring bike. I have gotten so many compliments on it. It's a beautiful bike. Good looking bike - very sleek. Have fun - enjoy the ride. Thanks for sharing. It is a beautiful bike and I love the look of the hard bags. Enjoy! Be safe.